In case it seemed like I obsessed about my frozen water lines last year, you'll all be pleased to know that my lines are already totally frozen again this year. Sigh. 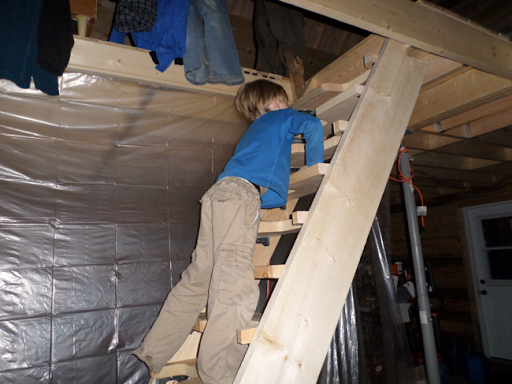 Using a ladder to travel between the main floor of the cabin and the loft got very old, very quickly. My poor feet have had enough of walking on ladder rungs in less than supportive footwear. Especially if we were carrying anything other than ourselves! 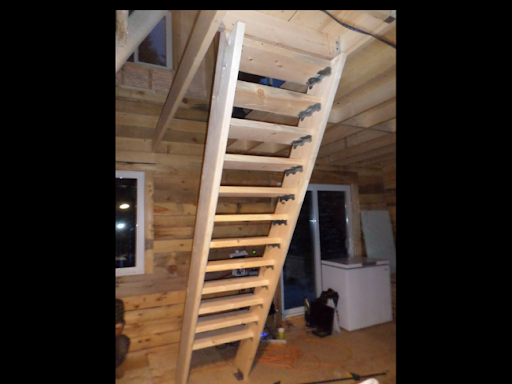 With that in mind, I quickly purchased the initial materials to construct a set of simple but sturdy stairs. I opted to go with two by ten inch construction to ensure strength and stability. I am pleased that I did not go any smaller. One thing that was shockingly expensive was the steel hardware to actually assemble the runners and attach the stairs to the floor and landing. I had considered making these parts out of lumber, but then felt that speed of construction and finished look would influence this decision. 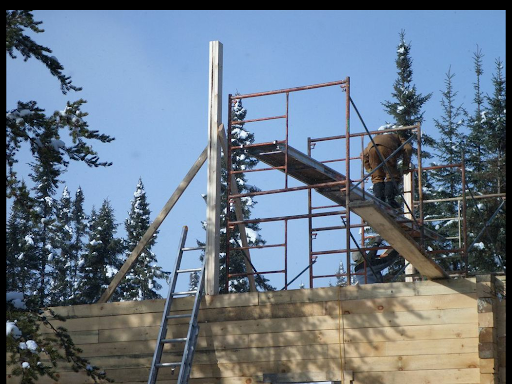 I almost returned to building them myself when I realized how dear they were - but I wanted to get the stairs up quickly, and liked the look of the wood and steel working in unison. It took a fair bit of "figuring" to get the angles correct for the stairs. Unfortunately they could not be put at my new favourite angle - 45 degrees. This would have had them finishing too close to the outside wall to be comfortable, and also I have a "trap door" in the floor at the bottom of the stairs to access the crawl space, and this door would have been too covered by the bottom stair if the stairs were at any less of an angle. As such, they are at about a 58 degree angle. It is much better than I had feared. An early error I made was to measure along the upper length of the stairs and divide my treads up at eight inch intervals. I had in my head an eight inch tread height as being a good compromise between the steepness of the stairs, and my desire to not build more treads than I had to. Of course, I forgot to take into account the fact that my stairs were not at a ninety degree angle, so when I tilted each tread to make it level, I wound up with a tread height of more like six and three quarter inches. This is still considered an acceptable tread height in some building codes. I was reluctant to replace the sides of my stairs because of the screw holes already in place, so I accepted this oversight. It was purely a matter of not conforming to my original thought, and didn't have any real effect on the utility of the stairs. Or, lack of utility as the case turned out. As I placed the final tread available (I was actually two treads short - another miscalculation that I felt would be easily fixed with another trip to the lumber yard), I felt the stairs at least LOOKED like real stairs. Walking up them was a totally different matter. Due to the steepness, the treads overlapped one another by six inches. This only left a tread depth of four inches. Trying to walk up the stairs in a normal matter was rather treacherous. One's toe was constantly catching on the tread already occupied by the opposite foot. Then when your foot came down, it was only on the ball of your foot that you could get your purchase. We endured this for about a week while I hatched my next plot. What goes around, comes around. I had originally considered my options if I was unable to get a proper set of stairs into the cabin. Spiral stairs were thought of, but discarded as too difficult to either build, or fit into our plans. 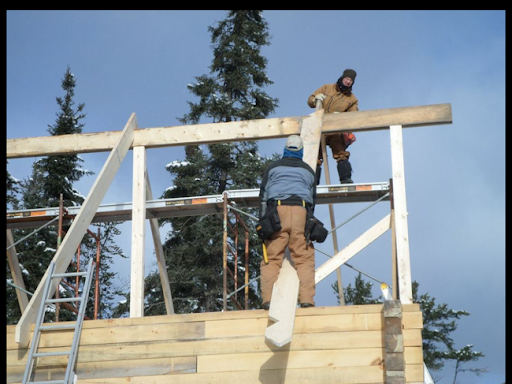 The ladder was something that perhaps Kenny could endure for years, but this is not just our cabin, it's also our home. A ladder as a day-to-day item was just not in the cards. And so it was, I felt I had been backed into the corner of building my "paddle stairs" or "alternating tread stairs". I looked up a few pictures of crazy concepts online, and opted to try to create something fairly simple and traditional looking. 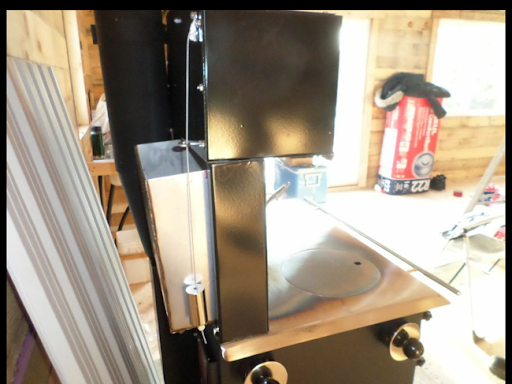 I purchased a bandsaw (fortunately on sale at Canadian Tire for the same price that people were asking for on Kijiji). 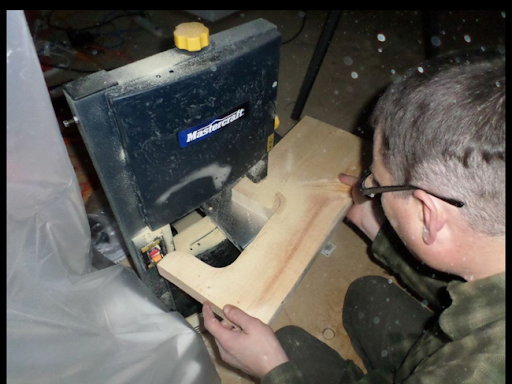 The nine inch depth of the bandsaw looked to be a huge liability after I tried cutting my first template. But in frustration, when my tread hit the side of the bandsaw, I continued to push the free end of the board forward in an arc. This turned serendipidous, as the arc was quite shallow but aesthetically pleasing. I flipped the next tread upside down and repeated the process. The two treads meshed very nicely when replaced on the stairway, and I continued working my way along all my treads. Thus I have treads that are about a foot wide, with gaps that are about nine inches. The treads alternate their way up the run. 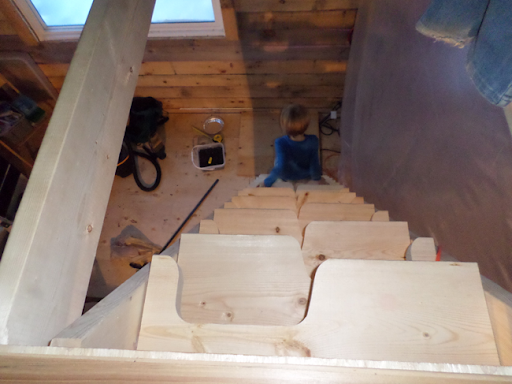 Once complete, I mounted the stairs for the first time and was quite comfortable to climb them to the top. Coming down is even more comfortable for me, I suppose because I can see the treads I am approaching. Kenny is contrarian, and says he prefers the old stairs, which perhaps suit his smaller feet better. I have a feeling that won't last as he grows and comes to appreciate the sizing of these ones. Donna feels they are a big improvement, although the final stair only had a tread depth of about five inches, due to it being up against the landing. I'm trying to come up with a solution to this issue, although it doesn't seem to be a deal-breaker. In any case, now we feel much more at ease heading up and down the stairs on a regular basis. The final touch will be a railing for anyone who has any qualms about them. I'm planning on mounting it against the inner wall, but we shall see how things proceed. 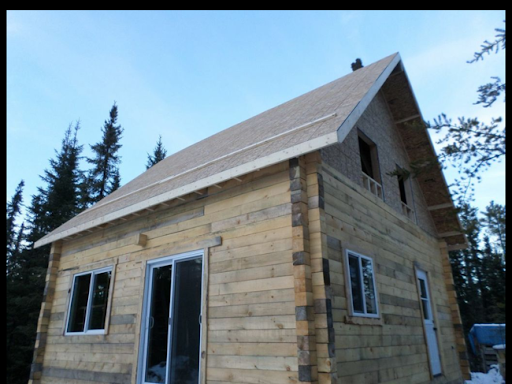 Moving into the Log Cabin! It has likely been obvious from the past two posts - we are in the cabin! As I explained, some of my posts are delayed by a week or more due to the chaotic nature of our life here. This sometimes has me describing a project and including a brief review of it all in one post. As soon as the cabin had heat and electricity, there was nothing compelling us to stay in the yurts any longer. In an afternoon we moved over the beds and food, and that was that! 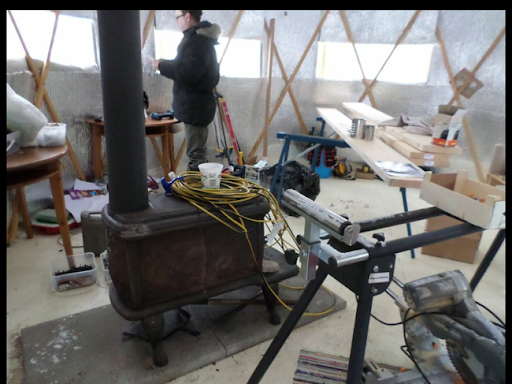 The cabin is MUCH warmer than the yurts, although it takes longer to get its temperature to move up. Generally speaking the upstairs is very comfortable. 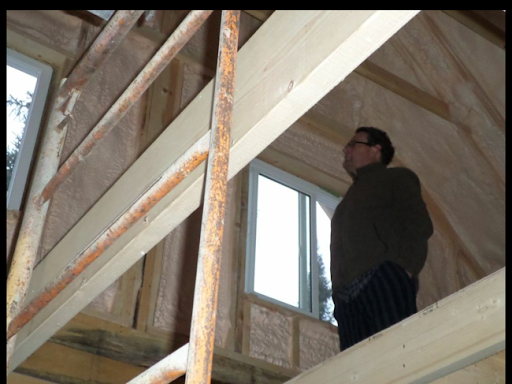 Kenny spends three quarters of his time up there, playing in the loft where he has many times the space he had in the yurts. 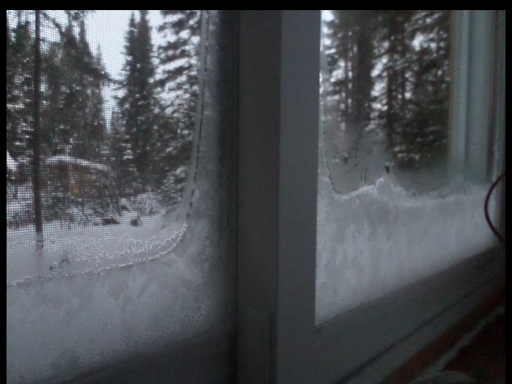 There are still spots where we can see gaps between the logs leading directly outside. 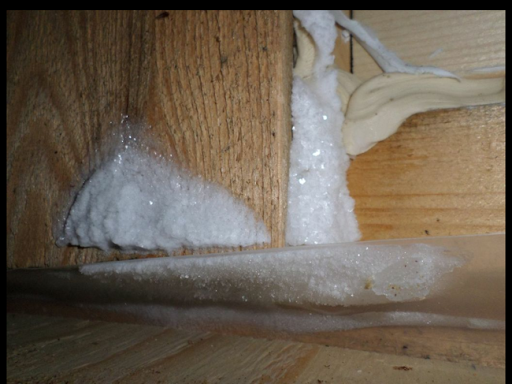 They are quickly sealed up with some caulking. Now it is mostly poor fits around my temporary window and door trims. I am confident that these can be well addressed next fall when I plan on vapour barriering the entire inside of the cabin and putting up wood panelling. My current looming projects are the stairs for up to the loft/bedroom(s) there. We had been using a ladder, but then I tried to build a staircase. It clearly needs some modification to make it more useable. I have some ideas, but we'll save them for a blog post all their own. It's challenging living in such a rustic place, but hopefully the increased light, space and heat offset the dust, lack of privacy, and general disorder. I have used some drop sheets to wall off what will ultimately become the master bedroom - this will be where we can cut the flooring and panelling over the course of the winter. I sure hope we can contain the dust to an acceptable degree! Better connection to the outside world! 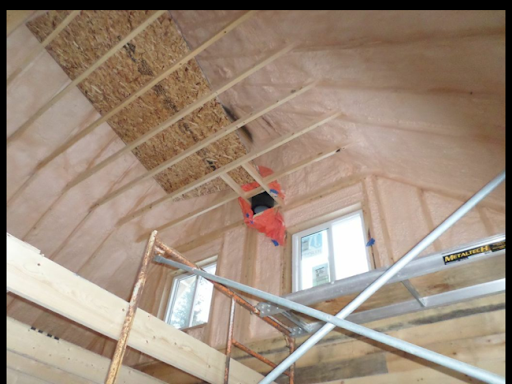 As close to nature as you feel in the yurts because you can hear every noise and feel every gust of wind, in winter, you have to have it sealed up tight to keep in the heat, and that means you don't actually see much of the nature around you. Now we have large windows on the south and west sides downstairs, as well as windows on the east and west sides upstairs. Kenny has already changed his choice of bedroom to take advantage of the east facing window which always has a spectacular view of the rising sun and brightest constellations of stars. More moderate temperatures. Even though it still cools off at night, we are not waking up to sub-zero temperatures and trying to light an ice-cold stove. The majority of mornings we are able to open up the stove and stir some coals back to life. This is dependant mostly on the night before and at what point we close up the air vents on the stove. 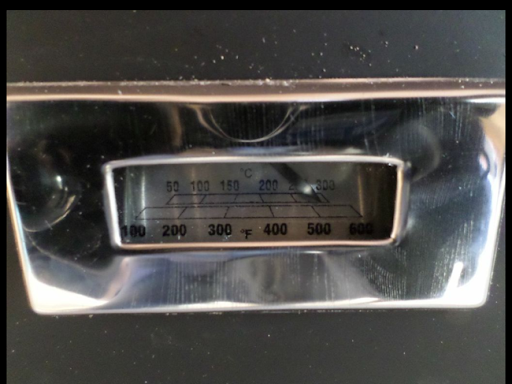 It sure helps to just spin the dials and throw on a log and expect some warmth. 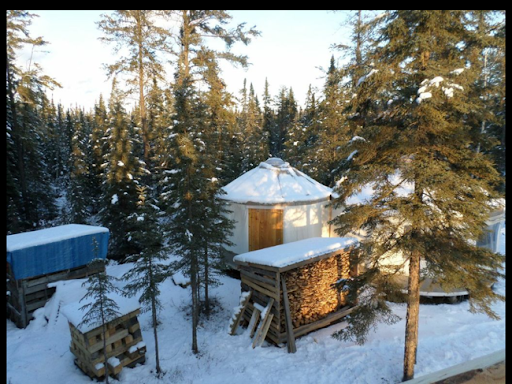 The only downside is that in the yurts the space was small enough that it heated rapidly. Here it takes noticeably longer to cool down AND heat up. Hopefully it will become even more even heated once the extra barriers are in place on the outside walls, and the inside walls and ceiling slow down the movement of heat in and out of the different living areas. The Yurts have quickly become an extra storage place, as well as a makeshift workshop. Generally I keep my tools there, but at -30, I bring them into the cabin to use them. In any case, I wanted to share this special time with the readers. We're still moving forward - even if it is three steps forward and two back with most experiments! 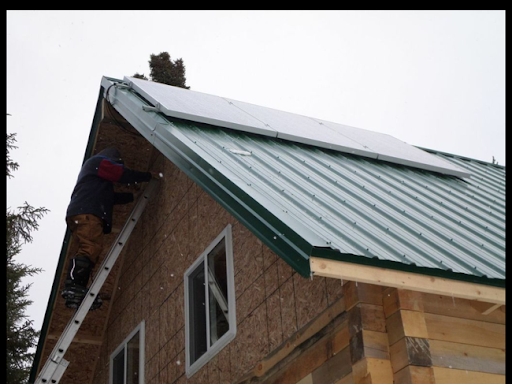 As the skies of November continued to turn gloomy, I more and more realized that I needed to find a way to expand my ability to produce solar electricity. My three 95 watt panels with a mid-range PWM controller were likely putting out a maximum of about 210 watts when in full sunlight. 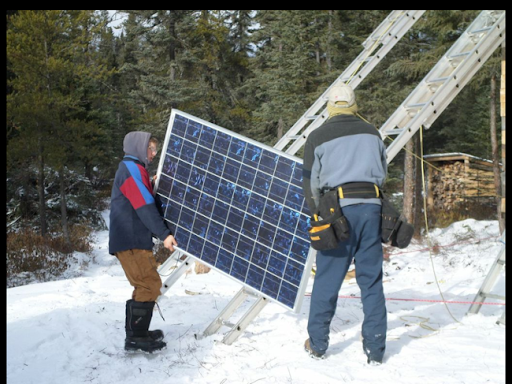 Full sunlight on these panels no longer was happening anyway, as the sun had fallen below the treeline for the location they were mounted. At first I had planned on relocating them to the roof of the cabin. But then I decided to use the move as an excuse to update. I purchased a new, MPPT controller and three 230 watt panels. My quick version of the difference in controllers is this: PWM works by taking the voltage coming off of my solar panels, analysing the battery condition, and then clipping the excess voltage off and discarding it and only letting in appropriate voltage to properly charge the batteries. This is ok, and will help your batteries to last long and get a decent charge, as long as you get a regular supply of sunlight to charge them. MPPT, on the other hand, converts the excess voltage to extra amperage, so you do not lose that power. This has two big benefits for me specifically. The first benefit is that you can have a fair difference in voltage of panels and voltage of batteries. Normally for a 12 volt battery bank, you would have 12 volt (really more like 18 volt) solar panels to charge them. 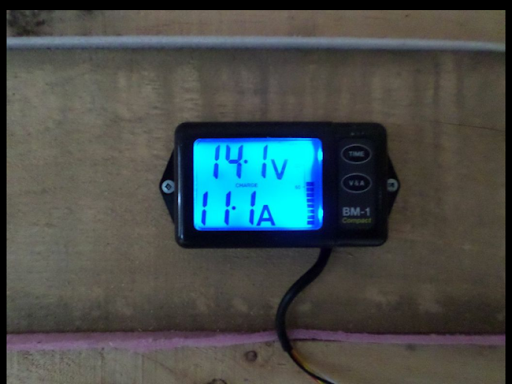 With an MPPT controller like mine, I can approach 150 volts on the input side, and it will automatically bring it down to an appropriate voltage with much higher amps. 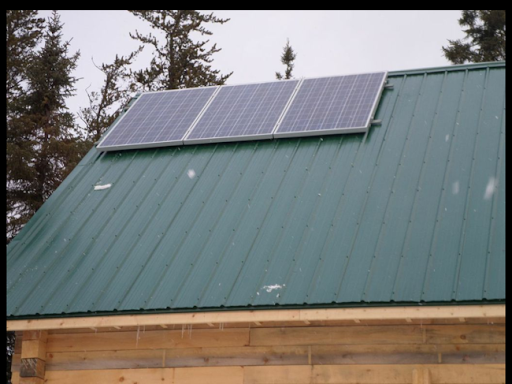 The other advantage for me is related to this - as we get extremely cold weather at times, this actually improves the efficiency of my solar panels, and I can acheive more than 100% of their rated output. This excess power on very cold days again does not get discarded, but is also put into the battery bank as increased amps. More on my battery bank at the end of this post. I spent many hours pondering how to attach the solar panels to the roof. There are some very expensive solutions available! They were certainly beyond my budget and desires. At first, I had obtained some retired vertical blind track, and was thinking of screwing it down and then inserting some bolts and washers with the thread facing up to mount the panels. Unfortunately, appropriately sized hardware was not to be found. On top of this, the aluminum track seemed to be rather flimsy when I considered the value of the load it would have to support. At last I discovered the concept of C channel, or strut from an electrical supply company. Combined with spring loaded nuts to fit in the channel, it worked perfectly! The panels were pretty much exactly the length of one strut when assembled side by side by side, so I had K! and R! cut the struts in half and space them apart a short distance. This meant that my centre panel straddled two struts. 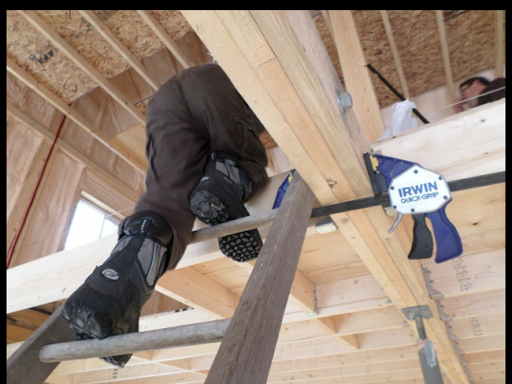 They assured me that they had lag-bolted the struts to my rafters, and they were very, very solid. We have stood up to some very high winds already, so I have to say I am pleased. After a quick trip to Maier Hardware to grab some longer bolts, they were able to pop up the panels by mid-afternoon. 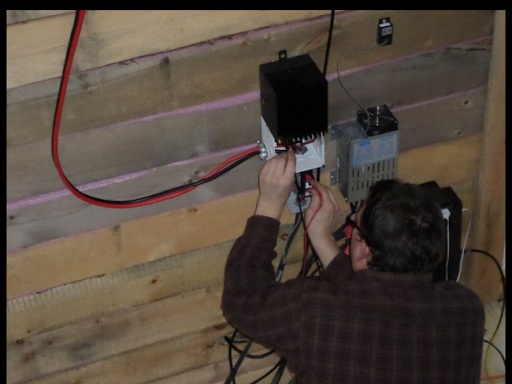 Feeding the wires into the cabin, I created my own terminal blocks up in the rafters and joined everything together. I triple checked to ensure proper polarity, and then threw the breaker. A little bit of juice went into the batteries, and then the sun set. The next day more juice went in, and I was pleased. Then we had about ten days of no sun at all, and I was frustrated. The past three days have been extremely sunny, and I could see the batteries taking in tonnes of amps the first day. Then half that amount the second day, and then half that amount again the third day... Which was yesterday. Imagine my surprise and annoyance when the sun set, the fridge came on, and after about fifteen minutes of the fridge load, my batteries had depleted about 30-40% already! They were fully charged (well, hopefully on the verge of going to float) only moments before. It's a very discouraging thought to consider that I may have to replace my batteries sooner rather than later. The budget for the homestead is already becoming an issue, and this isn't helping! Well, we'll just have to see. I'm still crunching the numbers to better determine the economics of batteries. I'm sure they would be fine for awhile yet if only they weren't in such a cold environment. Next year I plan on relocating the battery bank up onto my deck, and then insulating and covering it to an even greater degree. That should hopefully help somewhat. In the meantime, I will try to take pleasure in the awesome potential and look of these new panels! It was a sombre moment a few days ago when I saw my Mom's name come up on my call display. As expected, she was calling to let me know that my Grandpa had just passed away. This, on the heels of learning that our family friend (and huge influence on my life) R!L! had also suddenly passed on, was a tough thing to take in. It really made for a tough few days. 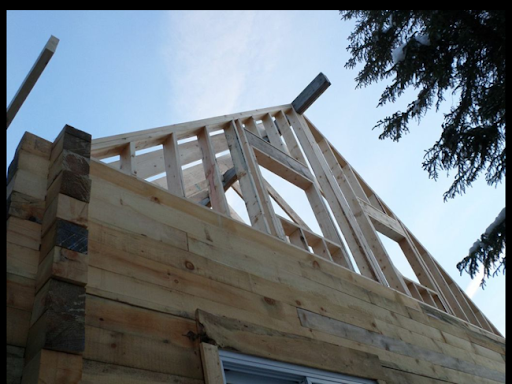 All these events were transpiring while the roof was going up, and inside there was lots of work for me to accomplish. 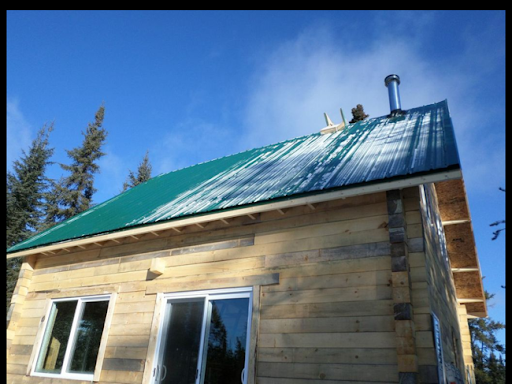 Even as the roofers were putting down the steel, I was getting the stove up and running. 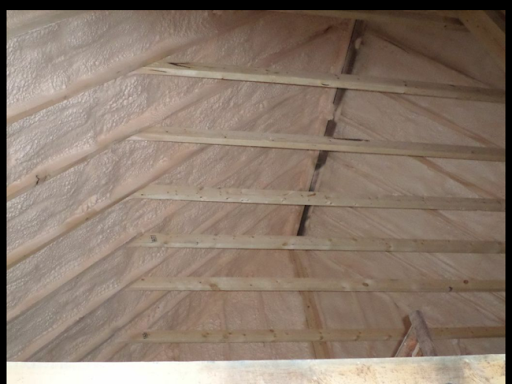 First Grandpa and I finished insulating, vapour barriering (is that a word? ), and screwing down the plywood on the floor. 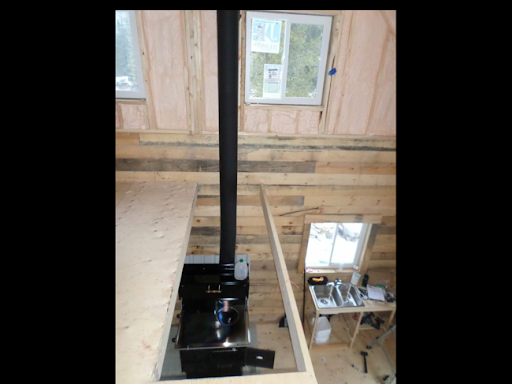 Then I located the spot for the woodstove, and we screwed down two sheets of DuRock, to make an approximate five foot by five foot square. Donna had noted that the woodstove surface was ever so slightly low for her, so I opted to put a patio stone down under it. The footprint was nearly identical in dimensions to a stone, so it seemed to make good sense. 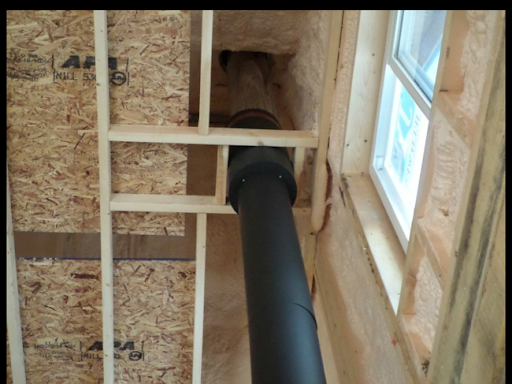 Here you can see the poly pipe for "hot water" to be carried to the bathroom and kitchen sinks. It remains to be seen how well this works. I believe I will have to put some sort of adapter from the reservoir to the poly pipe to space it away from the heat of the stove. Reinstalling the doors on the stove was a snap. The rest of it was a much larger head-scratcher. We didn't receive any assembly instructions, and it wasn't quite as obvious as one may think. The two side supports were obvious, and locating the water reservoir was pretty straightforward. When it came to the warming closet though, things became more complicated. Notwithstanding a small modification I made to the warming closet that I will relate in a moment, one had to hold the nuts for the warming closet from underneath, in a location that was actually INSIDE the water reservoir. This was very frustrating and difficult. The end of the stainless steel was razor sharp and unforgiving. The backs of my fingers still show scars from that particular battle. A sheet of spare steel for a heat shield would suffice until we were ready to move in. 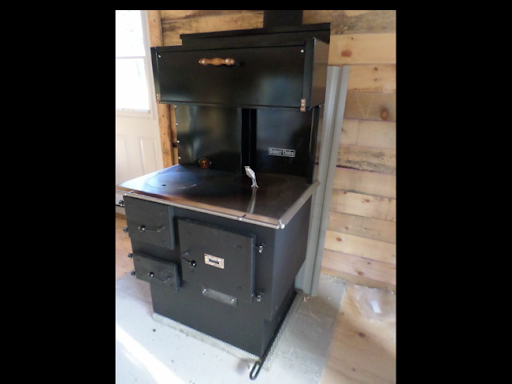 The stove has a 7" oval stove pipe fitting. 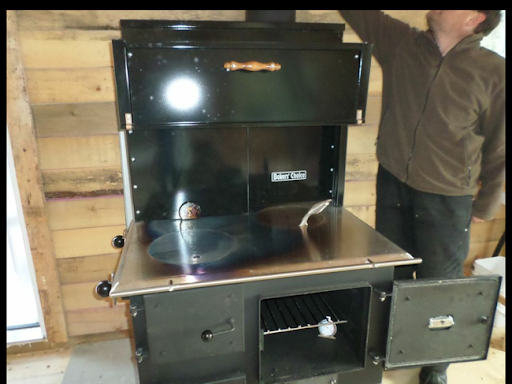 They ship the stove with a single-wall stainless oval to round adapter. This looked to work great, except I was trying to minimize clearances with the stove, and you have to work out from your weakest link. This would have been the adapter - and single wall wasn't going to cut it. The helpful fellows at Thunder Bay Fireplaces suggested I purchase a foot long piece of double wall stove pipe, and just force it onto the oval fitting as an adapter. I had to use my tin-snips to also cut away part of the base to get it to fit onto the stove. Even so, it was leaning back at a fair angle, and I ended up also modifying with snips the next piece of pipe. This all served to finally get the stove pipe running straight up from the back of the stove. It looked pretty good! Then I went to install the warming closet and realized that it stuck out the back of the stove about two or three inches! Once again, I was bitten by the Law of Unintended Consequences - the most important law of the homestead! 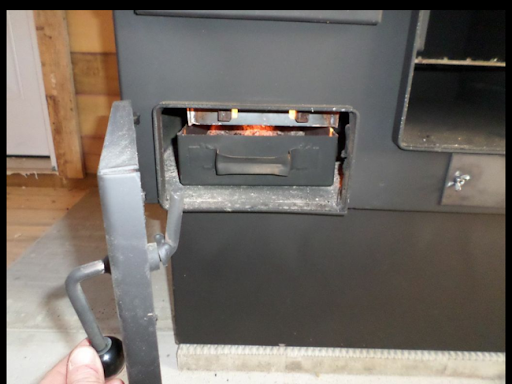 I drilled new attachment holes in the warming closet and brought the back of it flush with the back of the stove. This had the stove pipe right against the back of the stove and closet, so I took a spare decorative pipe band, and used it to actually anchor the stove pipe to the back of the warming closet. This not only looked really complete, but added support. I also wonder if it won't help make the closet slightly warmer. The double-walled stove pipe is really remarkable! I find that I can rest my hand on the outside of it most of the time, even with the fire going merrily away - this almost seems to be better performance than the all stainless and all insulated Selkirk pipe I have in the sauna which seems to get too hot to touch (although not scorching hot). With a little bit of shuffling back and forth, I managed to get the stovepipe seven inches off of the outside wall (code calls for six, but I want to leave room to panel the wall behind the pipe next fall). 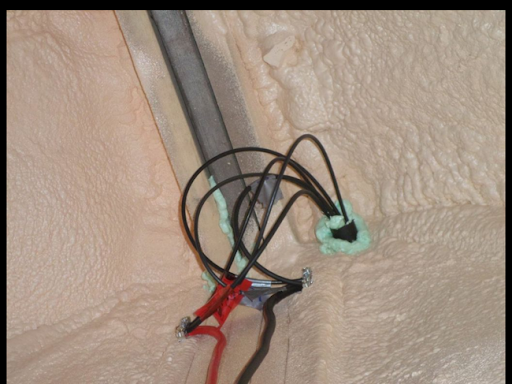 I also think I did a pretty good job of making it straight up to the collar where it switches to insulated pipe for the trip through the roof. 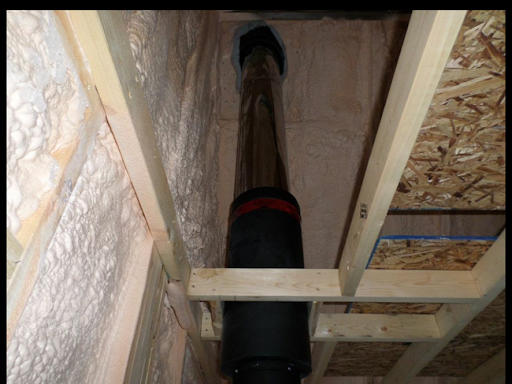 At the collar, I installed the telescoping piece of pipe. 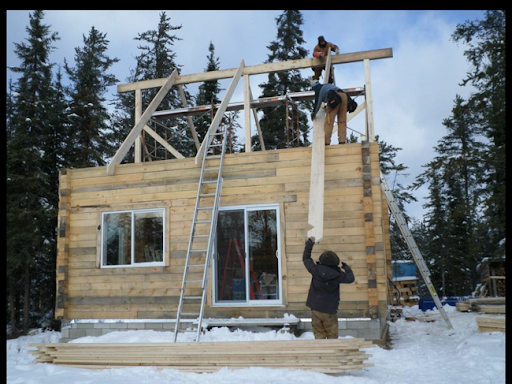 This should allow the cabin to settle a number of inches and not have any effect on the chimney. 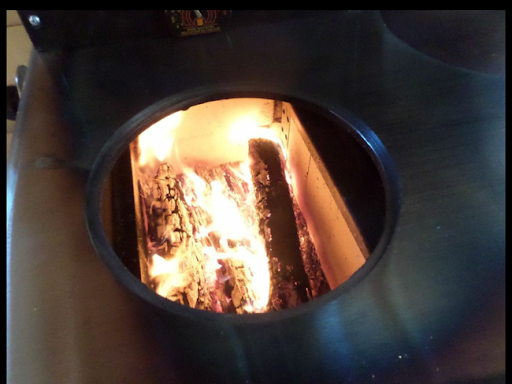 One thing I have noticed - the firebox is not as deep as I had anticipated. 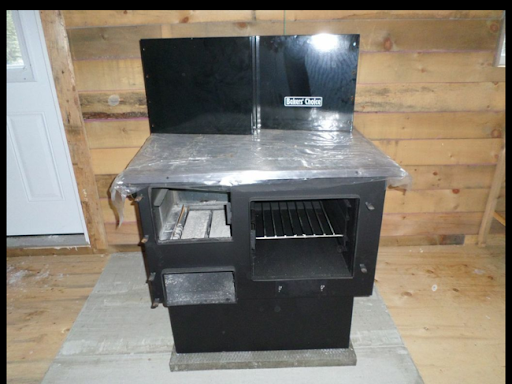 I was spoiled in this respect with the box stove, which has a VERY deep firebox. The literature on the Baker's Choice also describes a deep firebox so I hadn't been cutting my wood much shorter. We have been finding that a number of my logs need to be put in diagonally to fit, or resting on the lip inside the door. This isn't a huge hardship, but just something I personally have noticed. 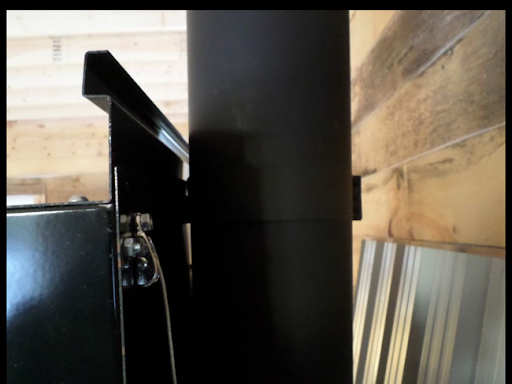 If there are logs that are simply too long, we set them aside to use in the sauna, where the stove still has a pretty deep firebox. While Kyle was still fastening down the steel roof, I fired up the stove with much excitement and trepidation. It took me three or four goes to finally get her lit. But when I did - it was pretty awesome! The draught is excellent with a straight, tall chimney effect. One of the adventures of a new stove and new stove pipe is "curing" the paint. Here I open up the oven door after a few minutes of heating it up good and hot and you can see the smoke pour out. It no longer does this, although sometimes with a hot fire we do still notice an odour. We have made a number of soups on the top of the stove, and I think I am correct in stating that it gets much warmer on top than our box stove in the yurts. We can boil water much more quickly and readily now than we did in the yurts. 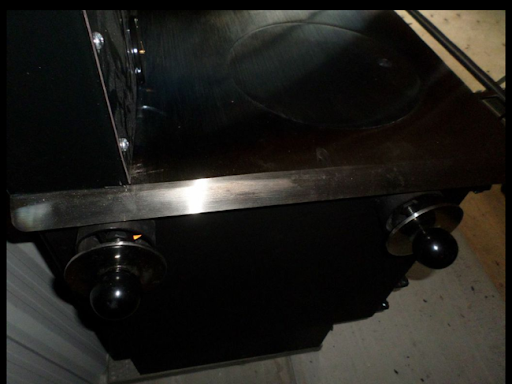 We normally keep the damper closed to force the smoke around the oven, and then leave the oven door open. Suppertime Stoves suggests this is the best way to use the stove to heat up your living space. Joy of joys - we even had pizza one night! 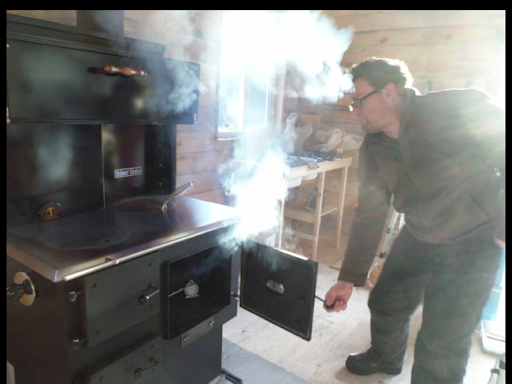 As you can see, we can get the oven quite warm, and having pizza from a wood-fired oven is just sooooo thrilling! For someone raised in a culture with ready access to an oven for baking, having something baked after 18 months of stove-top food is a real luxury. 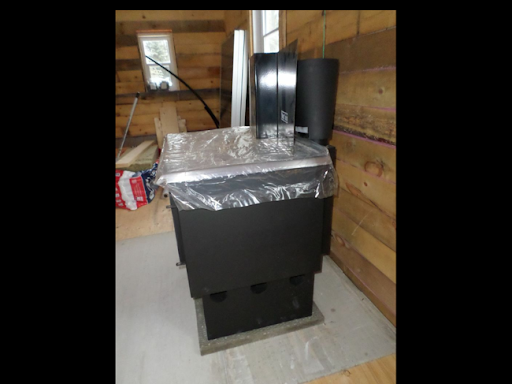 The other nice thing about this stove is that it is (or nearly is) air-tight. At night we can dial shut the air vents and close the door tight, and the fire continues to throw heat for hours. 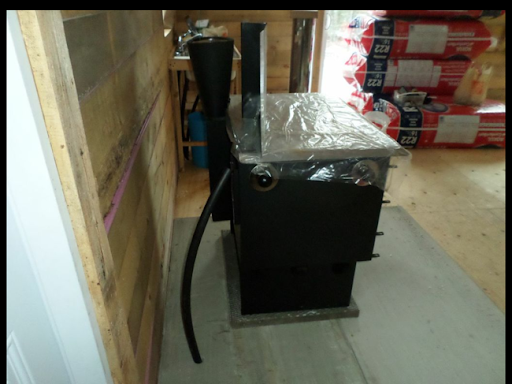 So far we have been able to wake up about half the time and find coals enough to just add more wood and get the stove to come back to life. 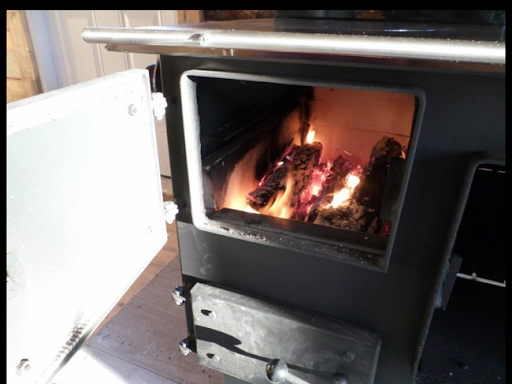 This is practically un-heard of in the old box stove in our yurts! The ash-pan is a nice feature. We find that we have to empty it every three or four days at our current burns. I also find that in spite of the warning to not open the ash pan door while a fire is going, it actually can be very helpful when you are having trouble getting the fire lit. The draught from having air intake UNDER the wood is amazing, and it is thrilling to hear the roar of the air and fire mixing this way. I always close it back up again when I am sure the fire is going to take, and I never leave it open when I am not directly tending the fire. Upstairs in the cabin is always super-toasty warm while the fire is going. I often fall asleep on top of the covers and only migrate under them a few hours later when it cools off a bit. The main floor is generally cool, but nothing like what we encountered in the yurts. I am confident that when I find and seal all the cracks, and then next year add a vapour barrier and panelling, we'll be super warm down here as well. Once again, these posts are a little bit delayed between things actually happening and the posts going up. It certainly isn't as severe as the last few posts though... These events are all less than a week old. It's just that this has been a difficult time for us on the homestead. There have been ups and downs as far as the logistics of the homestead itself goes, but I also just learned a few days ago that my Grandfather has been diagnosed with a terminal illness. I have been extremely conflicted about this situation. It is hard to imagine a more difficult choice to make as far as to try to arrange a short-notice flight down to see him one final time, or to remain here with my family and maintain the gains we have made. I know that Grandpa Ken (yes, Kenny was named for his great-Grandpa) is surrounded by many, many friends and family and is well loved and cared for there. That certainly helps. 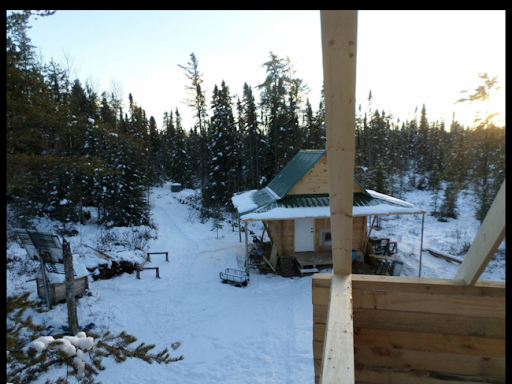 Here, with the last of the contractors finishing the cabin, the temperatures dropping to ten and twenty below, and our water lines (both in and out) having frozen up in the past two days, I really feel it would be a difficult hardship to impose on my family here. I called my Grandpa and spoke to my Grandma (he was sleeping) and let her know that we were thinking of them. It was probably more comforting to me than her, but it felt good to be sure that she knew we were praying for them. 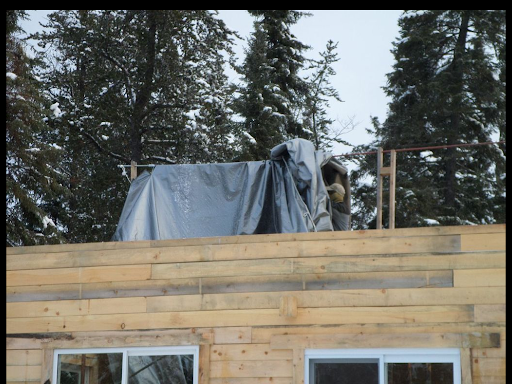 Here on the homestead, with the cabin roof structurally complete and the ice and water shield installed, it was time for the insulation to be installed. 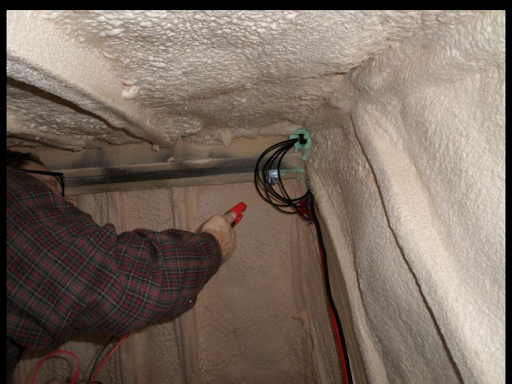 As per every recommendation a rational person could find, we opted to go with spray-foam. It provides a very compelling R-value, as well as structural attributes that are hard to beat. 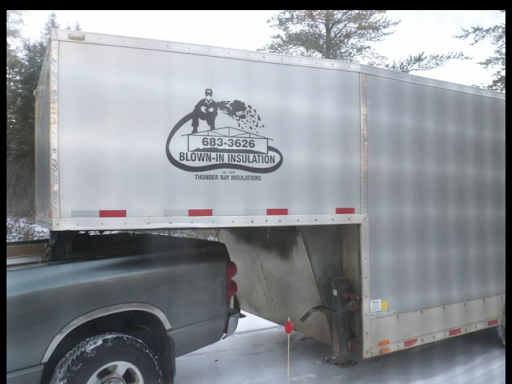 The fellows showed up that morning with a huge trailer and their own, impressive generator. I jokingly suggested that I could mooch some electricity from them and they surprisingly agreed right away. I thought my 4000 watt generator was pretty peppy... They had a 40,000 watt diesel in the back of the trailer! I did feel a little special though when they pointed out that it would take them two days to install the foam, and that their generator needed to be warmed up before it would start on day two. They actually needed me to run my generator the next day to warm up THEIR generator before they could continue the job. After carefully covering and masking any areas that I didn't want overspray foam on, they set to work in full body coveralls and breathing masks. The gasses during installation are not that healthy to breathe directly, but after only a few hours it is perfectly acceptable. I found that after only a few hours I couldn't notice an odour, and certainly after a day it was innocuous. Contrary to their first assumptions, they were able to complete the job in a single day. They normally have to give the foam time to cool off and cure between four inch coatings. 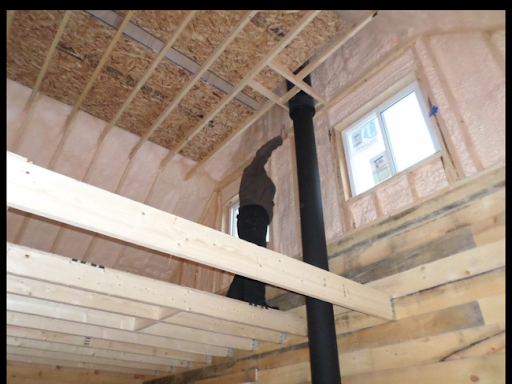 The day they installed was pretty cold though (twenty below or so), and the foam on one side of the cabin had cooled sufficiently by the time they finished the other side, so they were able to return to their first work and build it up to a good depth. 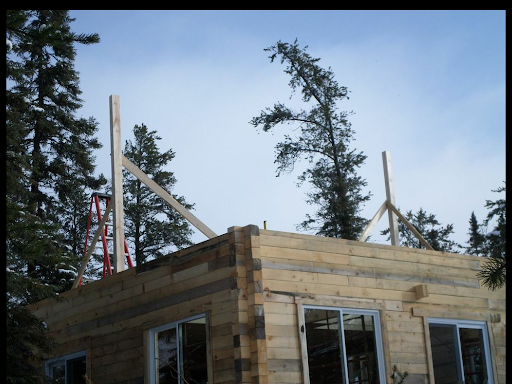 I apologize that we didn't have any "in-progress" photos, but one could hardly expect my staff photographer and ouchie-kisser Donna to risk life and limb going into the cabin while it was being sprayed. I did do a careful inspection after they had left, and am very happy and hopeful for its ability to keep us warm in the years and decades to come. 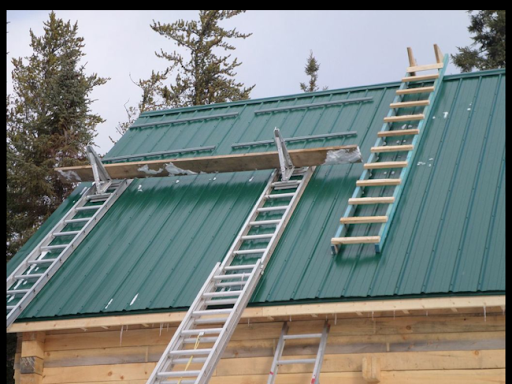 Bright and early Monday (well, shortly after eight - that's as soon as it gets bright enough to work here in Thunder Bay now...) Ranta Construction showed up to get cracking on our cabin roof. It was amazing how quickly things appeared to go together that first day. First some support posts at each end. 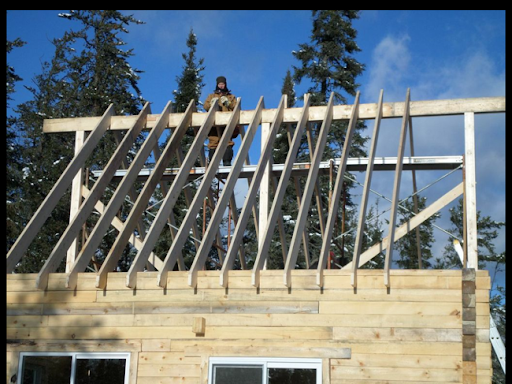 Then a long ridge beam, and another support post in the middle. After that, with Jeffrey cutting rafters and Kyle and Ryan skillfully and bravely assembling them, things began to take shape in no time. I couldn't help but insert myself into the thick of things a number of times (although I don't believe I provided any assistance. Kyle charges double when the client helps - a wise fellow!) to see how things looked. After a day or two though, I did come to notice that one of my jack pine trees does provide a little shade - I think that this is a very temporary thing though, dependant on this exact time of year. It is enough to convince me to wire my panels in parallel rather than series. While my new controller can handle up to 150 volts on the input side, I am using 4 gauge cables for about a twenty foot run. Plenty enough that even at 24 volts I won't suffer much in the way of cable losses. And wiring solar panels in parallel means that if one panel is partially shaded, it won't limit the current on the other panels, the way they would if they were in series. The first day was clearly the glory day. 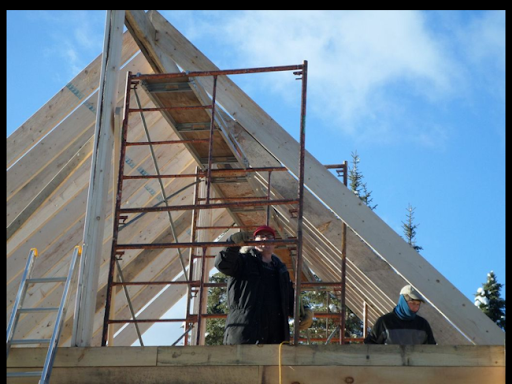 The second day as they framed the gable ends, things didn't change that dramatically. Day three though, that was another big one! 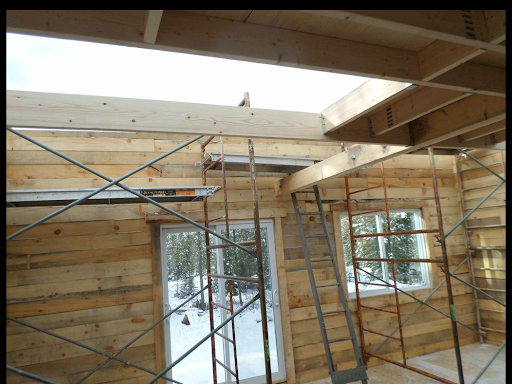 The sheeting went up and one could really see how the roofline and cabin came together. It was up until this point that I still had a feeling that the pitch of the cabin roof would overwhelm the overall look of things. Now I'm a fair bit more relaxed. 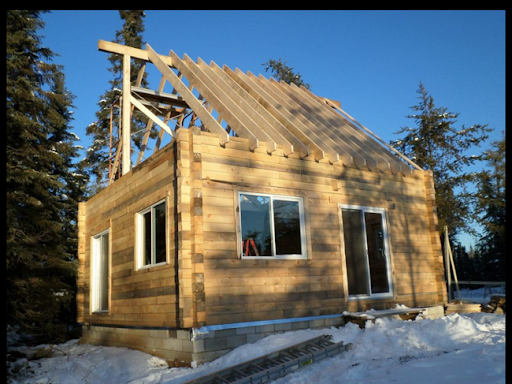 I think that the roof doesn't overpower the cabin, and complements it nicely. 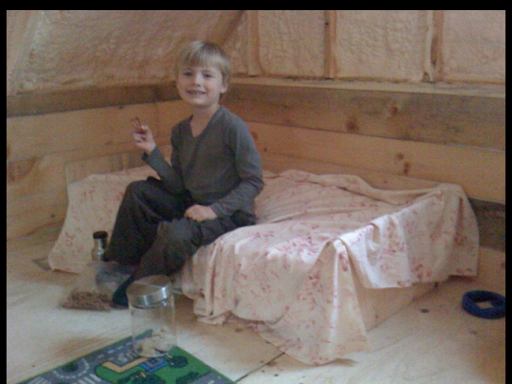 It also provides a very comfortable second floor space for Kenny's room as well as a spare bedroom/office. Family and Children's Services of Thunder Bay rang me up the other day to see if we were still entertaining the thought of fostering a child in the near future. I assured them we were, but that we still needed to have a roof over our own heads before we could think to provide one for others. They will reconnect with us in the spring to see where we are at.